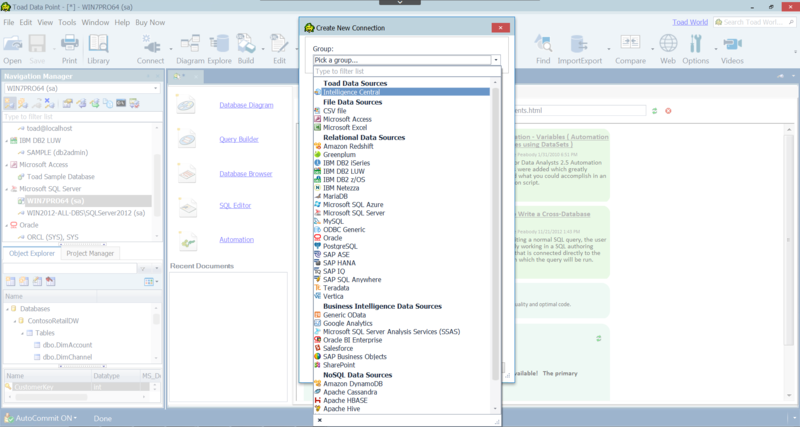 Connect to a wide range of data sources, including SQL based and NoSQL databases, ODBC, Business Intelligence sources, and Microsoft Excel or Access. Use a single tool for basic querying and reporting needs and get consistent results. Create a query without writing or editing SQL statements. Even for those familiar with SQL, the GUI (graphical user interface) makes it easier to create relationships and visualize the query. 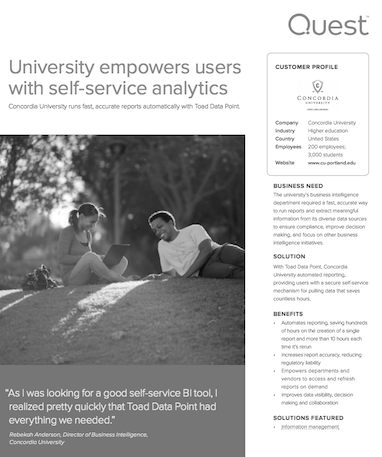 Toad Data Point Professional lets each user choose between two different interfaces depending on their work. 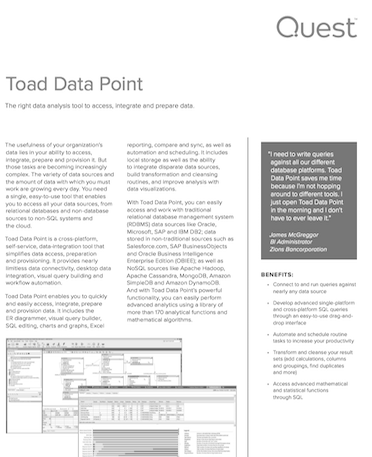 The Toad Data Point traditional interface provides ultimate flexibility and a deep breadth of functionality - like data compare, import/export and data profiling. 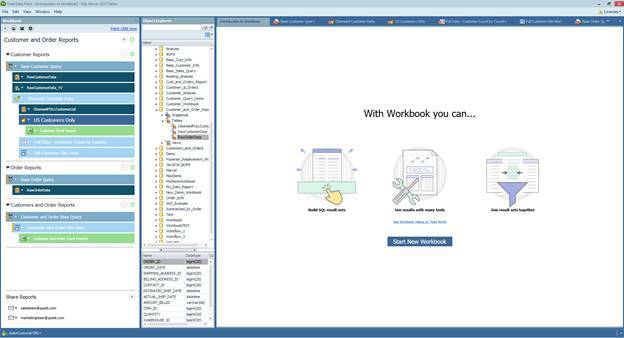 While the newer Toad Data Point Workbook interface allows users to simplify their Toad Data Point experience and build straightforward query-to-report workflows. 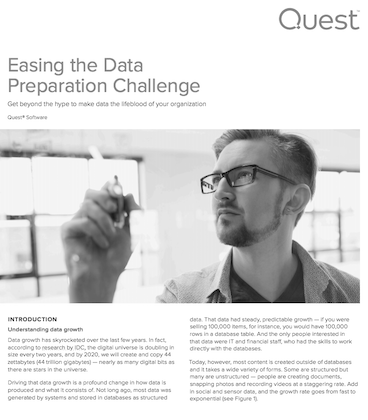 Connect to many different types of data sources, including relational databases, business intelligence sources, NoSQL databases, and files. Locate objects using Object Search, Database Explorer, or using a filter in Object Explorer. Design professional charts and graphs to share data results. Use the Cross-Connection Query Builder or the Cross-Connection Editor to create a query that combines data from multiple, dissimilar databases. 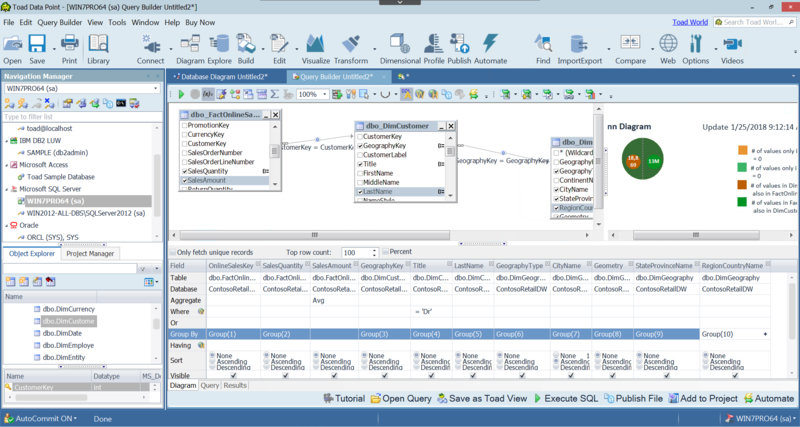 The editor combines a powerful SQL and procedure editor into a single interface. Customize options and shortcuts to make the editor look and behave according to your preferences. The Result Sets tab displays a data grid for executed SQL statements and scripts that return data. Export to your favorite tools. Access key data quickly, including built-in report and pivot functionality, for in-place analysis and single-click export to an Excel instance. Visually profile and sample database tables and data sets for patterns, unique values, duplicates, missing information, min./max. values and more. Save time on database tasks by easily scripting database activities and scheduling them using the Windows scheduler. Toad Data Point’s video library includes helpful how-tos and product information to help you get the most out of Toad Data Point. The Toad World Forums is your place to ask and find answers to questions, and discuss Toad Data Point with other users, whether you're a new customer or an existing one.